I’m new to the world of sauces made from fresh fruit, but now that I’ve started making them, my thoughts are filled with ways to use them. Cupcakes seem like a logical choice. What is better than biting into a moist, fluffy cupcake and discovering sweet, delicious fruit? Nothing, I tell you. Nothing. 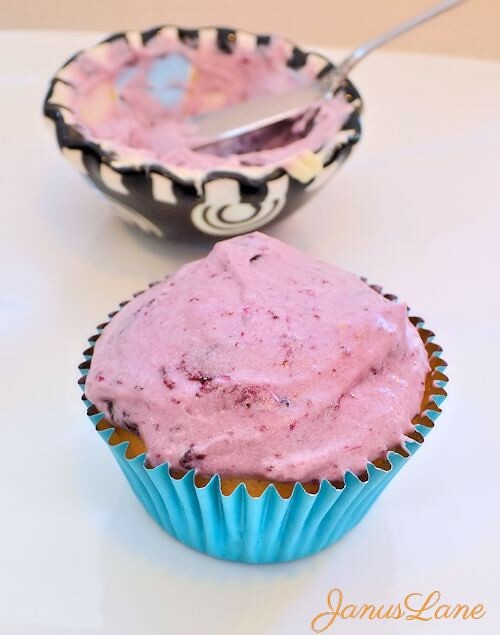 These Blueberry Compote Vanilla Cupcakes can be made three ways, which is just triple the joy. The first method involves a star-shaped silicon cupcake mold. I found mine at Wal-Mart, but I’ve seen some on Amazon too. If you overfill the mold with batter, you get a solid bottom so that you can fill the interior cavity with whatever you fancy. For me, this time, it was blueberry compote. I have to thank Frugal Mom eh! for showing me how to make it. In case you don’t know, a compote is a dessert made of whole or pieces of fruit in sugar syrup. It is incredibly easy to make, and I suspect you’ll be seeing more recipes from me that includes it. You MUST spray your silicone molds with non-stick spray so that anything you bake in it slides out easily, without sticking to the sides. I cannot stress this enough. I use an olive oil spray and have had no issues with sticking. Flip the mold over so that it’s upside-down, then spoon the compote inside. I thought I took photos of this step, but apparently I didn’t. Or the camera was so impressed that it ate the photos. I’m not going to rule that out. 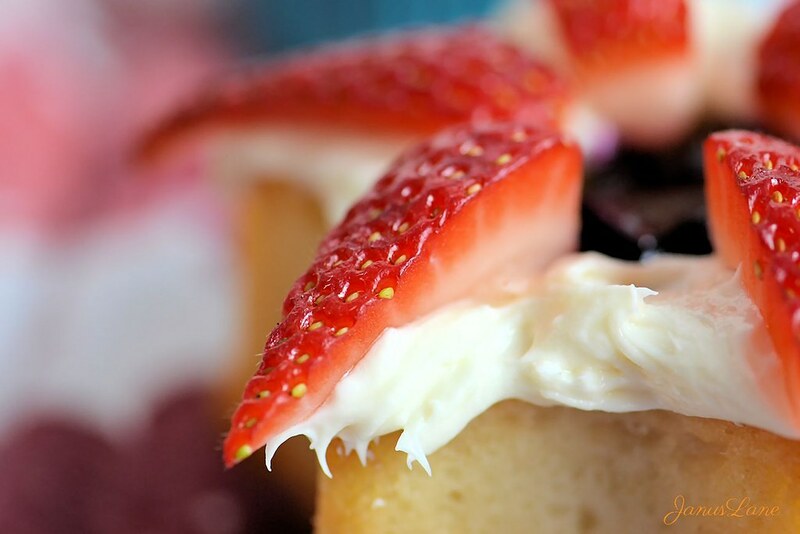 After the compote, apply your choice of glaze or frosting to the top of the cupcake (I use cream cheese frosting, recipe below) and, if you so desire, top with fresh fruit. 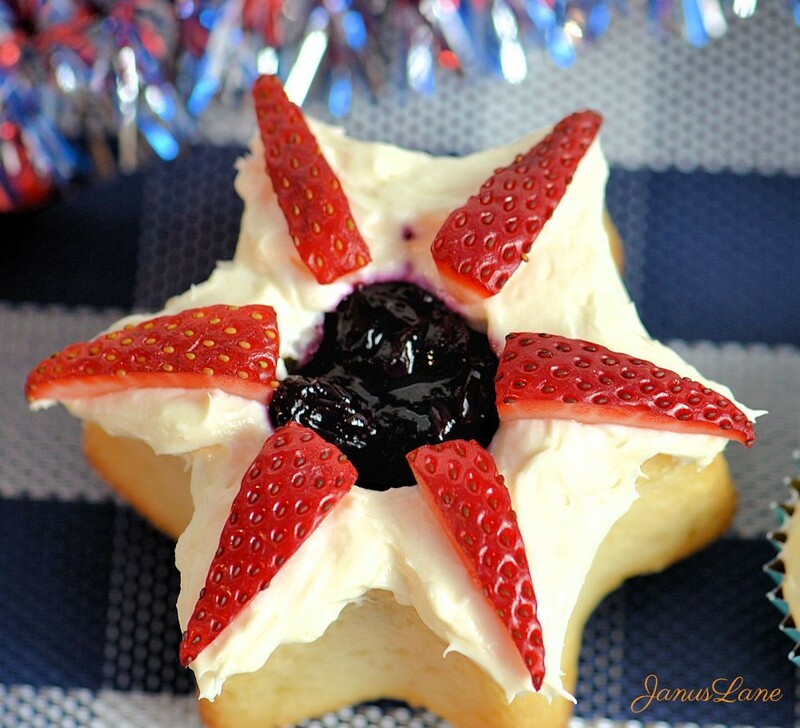 I used strawberries because I’ll be featuring these cupcakes in roundup of patriotic desserts and crafts. I think the slightly-tart blueberry compote is a wonderful contrast to the sweetness of the frosting, cupcake, and strawberries. It’s a beautiful creation, both in presentation and taste. For the second method, you just need regular cupcakes. You scoop out a small portion of the inside (and eat that part right then, of course, because you deserve it) and put the compote inside before icing the top. Sorry for the picture quality of this one, I needed to get these done but the lighting in my kitchen was just awful. The final method, and definitely the easiest, is just to simply top your cupcakes with a spoonful of the compote. You can skip frosting altogether then, if you want. The cupcake recipe is my go-to for all my cupcakes, and I found it at Life, Love, and Sugar. I mix the ingredients together a smidge different than her, but the ingredients are still the same. I’ve yet to find a recipe that comes close to it. I modify it on occasion, like for my Pink Lemonade Cupcakes, and have found that it’s easily customizable. There’s a lot of great cupcake recipes on Linday’s site, so when you’re done drooling here, go take a gander at her blog. If you have any leftover compote, it’s great for topping breakfast foods, or you can mix it in with frosting for blueberry frosting, just don’t use too much or you’ll make the frosting too thin. Do you use compotes in your baking? Follow Janus Lane’s board Cakes & Other Sweets on Pinterest. Moist, delicious, fluffy vanilla cupcakes are filled and/or topped with sweet/tart blueberry compote. Vanilla cream cheese frosting rounds off these cupcake triple-threats. In a large bowl, whisk together the flour, sugar, baking soda, and baking powder. In a separate large bowl or a stand mixer, on medium speed, mix together the milk, sour cream, butter, egg whites, and vanilla extract (mix for about 5 minutes). Add the dry ingredients about 1/2 cup at a time while mixing on medium speed for 3-5 minutes. Remember to scrape the sides/bottom frequently during mixing. If using silicone liners: Spray liberally with non-stick spray. Fill liners 3/4 full and bake 20-25 minutes. Let cool completely before flipping over to slide the cupcakes out (I put mine in the fridge to speed the cooling process). If using a non-stick muffin or cupcake pan, fill liners 3/4 full and bake 18-20 minutes. Let cool before icing. In a small saucepan, mix together the blueberries, lemon juice, and sugar. Bring to a simmer and cook for 20-30 minutes, until the blueberries have broke down and the consistency is moderately thick. It will get thicker as it cools. Remove from heat and let cool before spooning into or on cupcakes. Using a stand or electric mixer, beat the cream cheese and butter together on medium speed until smooth (about 5 minutes). Scrape the sides of the bowl with a rubber spatula during the mixing process to ensure it is well-mixed. Beat in the vanilla extract. On low speed, add in the confectioner's sugar. Once it has been incorporated into the frosting, switch to medium/high and continue beating until smooth and creamy. You can add slightly more or less sugar and lemon juice, depending on your taste. I only had about 3/4 cup of blueberries, so I used 1 1/2 tbsp of sugar and 1 tbsp of lemon juice. I'd be happier than a pig in mud if you shared this post! 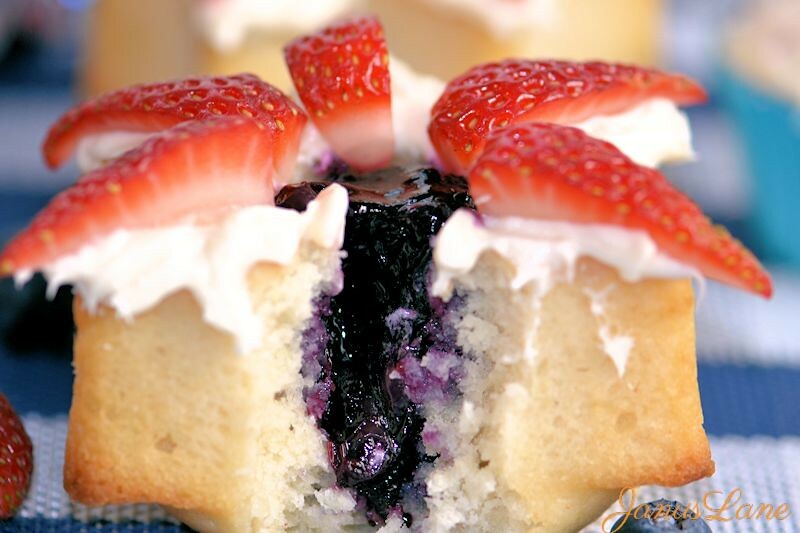 This entry was posted in Recipes and tagged blueberry, compote, cupcake, dessert by Steph. Bookmark the permalink. How beautiful! Thanks for sharing this with us at Bloggers Brags. I’m pinning to our group board on Pinterest! These look AMAZING! Thank you for sharing them at the #SmallVictoriesSundayLinkup! These look so delicious and pretty too. I’m definitely going to have to try your recipe. They’d be perfect for 4th of July, too! Thanks so much for linking up with #ShareTheWealthSunday! That sounds like a really nice cupcake recipe. I might just try it and try and choose one of those delicious ways to serve it. 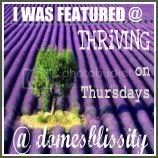 Thanks so much Janus for linking up to Thriving on Thursdays. It was lovely to see you there. I’m featuring this recipe at tomorrow’s party. Hope to see you again! My mouth is watering!! They look so delicious! I’m visiting from Two Uses Tuesday. I love the strawberry star, what a great idea. Thanks. I’m really happy with how it turned out. This is where you make my day and subscribe for new posts. New posts only - no spam of any kind. Advertisements appearing on Janus-Lane are affiliate links. I will receive a small commission from items purchased through these links. Visit Janus Lane's profile on Pinterest. All content herein is copyright Janus Lane 2015. No content may be reproduced without prior written consent. Contact Stephanie at januslane@gmail.com for approval of content use or questions. Copyright does not apply to bloggers who choose a post from Janus Lane as featured content on their websites/blogs provided that a link back to Janus Lane is visibly displayed. Images are only to be used in a collage if they are part of a roundup. Full sized images may be used when a post of mine is featured, such as the featured post on a weekly link-up. Copyright © 2015 Janus Lane All Rights Reserved.